15-Apr-2019 15-May-2019 10:30 AGM Greens III (Sports Wing), Tropicana Golf & Country Resort, Jalan Kelab Tropicana, 47410 Petaling Jaya, Selangor Darul Ehsan. 23-Apr-2018 16-May-2018 10:30 AGM Greens III (Sports Wing), Tropicana Golf & Country Resort, Jalan Kelab Tropicana, 47410 Petaling Jaya, Selangor Darul Ehsan. 21-Apr-2017 17-May-2017 10:30 AGM Greens III (Sports Wing), Tropicana Golf & Country Resort, Jalan Kelab Tropicana, 47410 Petaling Jaya, Selangor Darul Ehsan. 28-Apr-2014 22-May-2014 10:30 AGM Greens III (Sports Wing), Tropicana Golf & Country Resort, Jalan Kelab Tropicana, 47410 Petaling Jaya, Selangor Darul Ehsan. ECS ICT IS THE WHOLE OWNED SUBSIDIARY OF PARAMOUNT. CAN YOU PLEASE GIVE SOME COMMENTS ON PARAMOUNT CORPORATION BHD, I AM INTERESTED IN PARAMOUNT. Paramount was one of the good companies recommended by Sifu Dr Neoh in his monthly digest long ago. I bought and sold it long ago. It is a stable growing company. TheContrarian How can ECS ICT be wholly owned by Paramount? Wholly owned means 100% owned. big77 SORRY, I MISINTERPRET THE ANNUAL REPORT. ECS ICT is not owned by paramount. Both companies are co owned by the largest shareholer Datuk Teo. big77 ONE THING MAKE ME WORRY IS THAT ECS ICT SHARE PRICE LOOKS LIKE KEEP ON DROPPING. IS THERE ANYTHING GOES WRONG? big77 THANK YOU Mr CALVINTANENG. big77 HOW AND WHAT ECS COMPANY BENEFITS FROM THE ICT, UNLESS THERE IS CONTRACT OF SUPPLY OTHERWISE IT IS JUST LIKE NORMAL BUSINESS SUPPLY COMPETITION. calvintaneng Young people these days spent alot of time playing games in computer lan game shop. sheryn74 What happened to this counter? No trading? big77 @calvintaneng, any good news, ECS is moving up slowly. I had sold a bit at 0.995, but still has quite a lot. Hope can make some money. cyeec2000 Why changed company name? Stefan ->changed to VSTECS , its major shareholder company name. cyeec2000 Stefan: unlisted?if unlisted why needed to change name?just proceed the cooperate exercised to unlist, could it be more related party transaction? Stefan The reason I said unlisted because seem like Vstecs HK is going to buy back more ECS share, it ady holding around 50%, doesn't left much for public (<25%). Personally think ECS does not need public capital to expand as their business strategy is quite conservative. anticonman ECS will be hit by E-commerce. Today those shop at Lazada today can get good discount. big77 @calvintaneng: Mr Calvintaneng, please look into Perak Transit (Ptrans), this counter is very well manage, very good earing and growth prospect as well as Very good as an investment stock both long and short terms. big77 ECS is dropping from RM1.04 on Monday to RM0.99 low today. 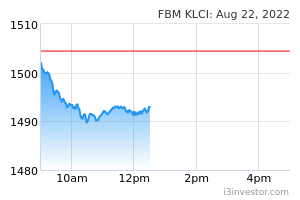 I should have sold all at RM1.03 but was hesitate , now only RM1.00 today's close. You must invest longer term. big77 during bad times, cash rich company has a lot of advantages, money is king during economy down turn. big77 BUY AND KEEP FOR LONG TERM. NOT TO WORRY. WHEN MARKET BACK TO NORMAL, THIS COUNTER WILL GO UP AGAIN. big77 HOPEFULLY. I INVESTED IN THIS COUNTER QUITE A LOT OF MONEY BECAUSE OF ITS STRONG AND HEALTHY BALANCE SHEETS. geraldt9 Bought last year ...don't waste time on this dead boring counter ! enigmatic hard to get capital appreciation from this counter. but credit to their management, NO LOSS from ANY QUARTER in the past 9 years along with consistent dividends.